Granby Town Hall is located at 15 North Granby Road, Granby, CT 06035; phone: 860-844-5300. 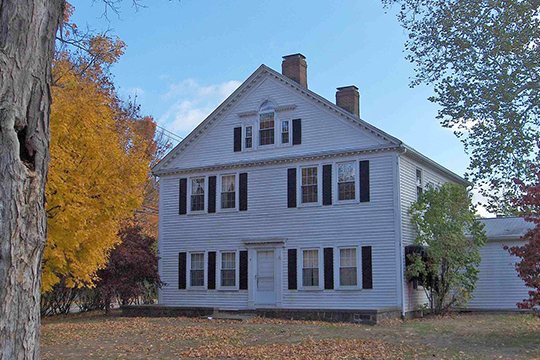 Photo: Home at 2 Park Place, Granby Center Historic District, Granby, CT. The Historic District was listed on the National Register of Historic Places in 1985. Photographed by user:Sphilbrick (own work), 2010, [cc-by-3.0 (creativecommons.org/licenses/by/3.0)], via Wikimedia Commons, accessed November, 2015. The first settlers of Granby, Connecticut, when the area was part of the Town of Windsor, came from Granby, Massachusetts, ca. 1664. In 1670 the land was transferred to the Town of Simsbury, and it was not until 1786 that Granby became a town in its own right. East Granby as a separate entity was taken in 1858, leaving the Town of Granby with 41.3 square miles. The principal neighborhoods in the Town of Granby are Granby Center, location of an important crossroads and the subject of this nomination, West Granby and North Granby. The primary occupation of Granby settlers was farming. In accordance with usual practice in colonial settlements, home lots were laid out in the community center, with additional acreage for fields, pastures and wood lots in outlying areas. The district includes many of the original home lots along Salmon Brook Street South. The First Ecclesiastical Society built its first edifice in 1740 as part of this cluster, near the cemetery that adjoins the green to the northwest of the district. The Society relocated its church to North Granby in the 1790s. David S. Ransom, Consultant, Connecticut Historical Commission and John Herzan, Connecticut Trust for Historic Preservation, Granby Historic District, Granby CT, nomination document, 1985, National Park Service, National Register of Historic Places, Washington, D.C.